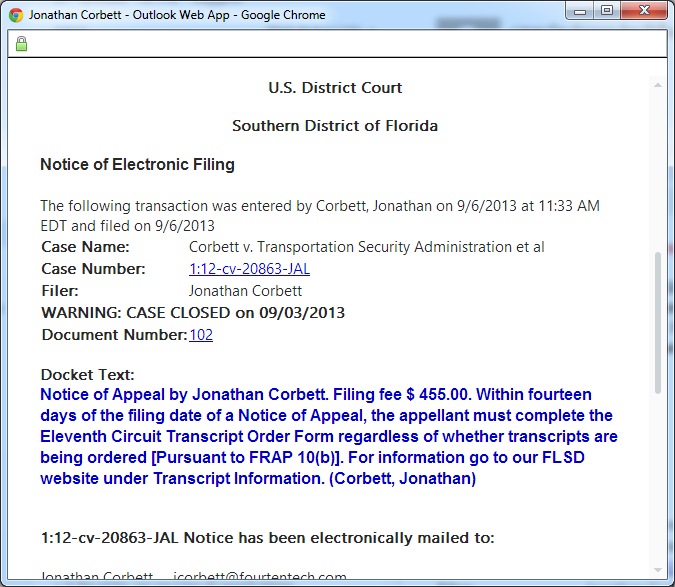 Notice of Appeal Filed, + What is This “Mootness” Stuff? I filed the Notice of Appeal today of U.S. District Judge Joan A. Lenard’s decision to allow the TSA to detain travelers, threaten them with false arrest, read through documents that they are traveling with, and lie in FOIA responses. Additionally, there’s been some commentary here and elsewhere on the Internets that Judge Lenard’s decision notes that my FOIA claim is “moot.” That is, my FOIA claim requested a copy of checkpoint video, and since I now have the video, even though they initially lied to me about it, there’s nothing more to be done. Mootness is a doctrine that stems from the constitutional requirement that only “cases and controversies” may be heard by the federal courts. The idea is that if there’s no remedy the court can take to make it better, the court should not be wasting its time. But, there is an exception to the mootness doctrine for illegal actions that are “capable of repetition, yet evading review.” In other words, a live controversy still exists if the government can continue to do the illegal thing and always claim it would be moot. In this instance, it is clear that the exception applies. FOIA would be meaningless if governments could simply lie and then, if caught, just say, “ok, you got me” and hand over the documents. I argued this exception passionately, and my argument was entirely ignored by this judge, as were many of my arguments for the 20 other dismissed charges. Plaintiff seeks declaratory relief to ensure that Broward County cannot continue to invent its own rules for public records responses. Broward County argues that the issue is moot because Plaintiff currently knows the truth. However, without declaratory judgment, Broward County may continue to lie in public records responses and then, only if caught, release itself from liability by telling the truth. As Broward County‟s unlawful behavior is capable of repetition, yet evading review, mootness is inapplicable here. See Roe v. Wade, 410 U.S. 113 (1973). It should be noted that in the State of Florida, knowingly refusing to comply with a public records request is a criminal matter. See Fla. Stat. 119.02. It is in the public interest, as well as the interest of state officials, to put officials on notice that federal law does not create a basis for lying in a public records response because of an SSI designation. I do think that the appellate court will overturn her ruling of mootness, as well as restore many (or all) of the remaining dismissed counts. Looking forward to this one. I’m sad to say that I think the Federal Courts are just biding their time until, in the ‘interest of national security’, the SCOTUS gives the TSA/DHS legal-immunity from prosecution. I seem to agree with esgatch on this one but I sincerely hope we are wrong. Yeah, I think all the “moot” comments are basically her way of saying that it is already so well established that the TSA is going to operate in an unethical fashion that trying to tell it to be honest at this point seems pretty futile. I mean, can we really expect to get the TSA to stop lying when we can’t even get them to stop sexually touching women and little kids? You know, she might have taken her time on those last two charges because she knew that you had a point here, but in the end what can be gained by her acknowledgment of it? Saying that your points are “moot” is not necessarily saying that you are wrong. It may just be a way of saying that the truth no longer matters. The issue is moot because it has been resolved. You made a FOIA request for video. It was originally denied. You were later provided with the video. So you got what you wanted and the FOIA case is now closed. Did you really think going to court claiming that the government was holding out on you while you refused to present any evidence to the contrary would go anywhere? Did you even read the post? The issue is not moot because failure to decide the issue presents a situation where the government can break the law and never be held accountable. First, I am 100% sympathetic to your cause and hope you prevail (thus my presence on your blog). Second, if the court of appeals is sympathetic to your case, you have identified an exception to the mootness doctrine court can rely on. But such exceptions are entirely discretionary and if the court is no sympathetic, if is in no way required to find an exception. I may be too cynical but the courts, especially the federal appellate courts, have been particularly deferential to agencies like the TSA. Is it too late to sue in Florida courts? If it is not too late, the federal ruling should not bar a subsequent state suit. But I don’t know Florida law so I don’t know if a penalties only lawsuit would be allowed. I do wish you the best of luck and if there is any justice left, the court of appeals will grant you relief. Just don’t be too excited about the mootness exception because it’s entirely discretionary.